Jon Challinor (right) equalised for Stamford at Belper. A 20-yard strike from Jon Challinor seven minutes from time saved Stamford AFC’s unbeaten record in the East Division of the Evo Stik Northern Premier League last night (September 10). Challinor’s goal forced a 1-1 draw for the third-placed Daniels at Belper. Stamford are third in the table, but with a game in hand on the top two. Spalding United also drew their first game without manager Chris Rawlinson who left the club after Saturday’s disappointing FA Cup defeat at Brantham Athletic. His assistant Matt Easton took charge at Loughborough Dynamo and watched a 2-2 draw. Goals from Jordan Lemon and Ben Davison twice saw Spalding lead in the second-half, but each time the Tulips were pegged back. Wisbech fought back from 2-0 down in 16 minutes at home to Lincoln United to draw 2-2. 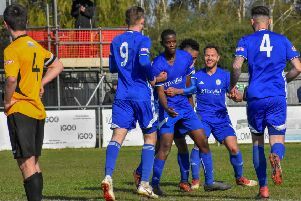 Aaron Hart and an Adam Millson penalty five minutes from time rescued a point in front of 167 spectators at Fenland Stadium. Wisbech are 16th, a point and a place above Spalding who are without a win, but have drawn four of their five league matches so far. Evo Stik Southern League Central Division leaders Peterborough Sports are at Corby for a Challenge Cup tie tonight (September 12). Sports are unbeaten this season in all competitions, but plan to field a few younger players this evening. Prelimnary round: Corby v Peterborough Sports.